Our luxury long leaf teas and infusions are brought fro m across the world, blended and carefully packaged in Yorkshire and sent to you through retail outlets and post. The leaves, herbs, spices, fruit and flowers which go into the teas are all of the highest quality, and organic ingredients are used where we can get them. We use bio packaging, and our packets are recyclable. All the blends are vegan by nature, and all can be drunk without milk (but some can be enhanced by a drop of dairy or non-dairy milk, lemon or honey). Many are caffeine free – marked CF in our shop. 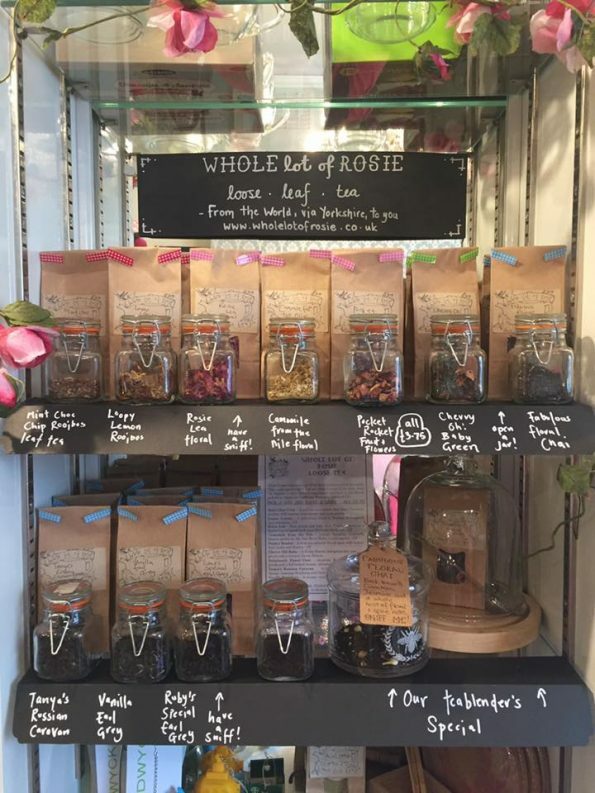 If you’re on a gluten free diet (or any diet) our teas and infusions are a welcome guilt free indulgence! Our ‘superfood’ matcha green teas contain the highest quality Chinese powdered green tea, and contain everything you need for a healthy boost to your immune system. Why not meet us at a market and get supping! 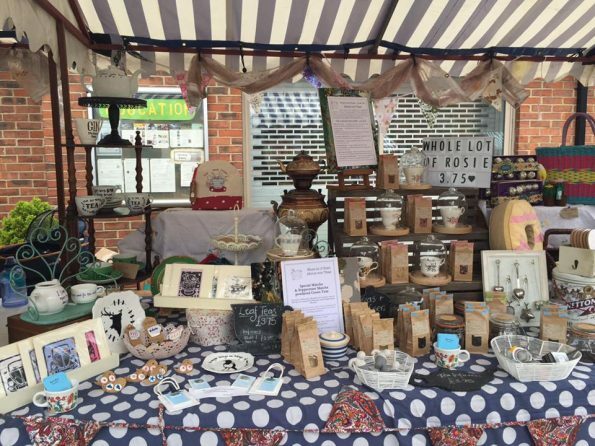 Whole Lot of Rosie is based in the lovely Yorkshire market town of Guisborough and is led by Miki Rogers, a designer maker and owner of the Ruby and Blue brand. Miki’s love of tea came from her Grandparents, with memories of their wonderful leaf tea dispenser, the tea delivered to the door and Grandad’s detailed tea-making instructions. Tea has since been a huge part of Miki’s life and many of her handmade products feature teacups and pots. 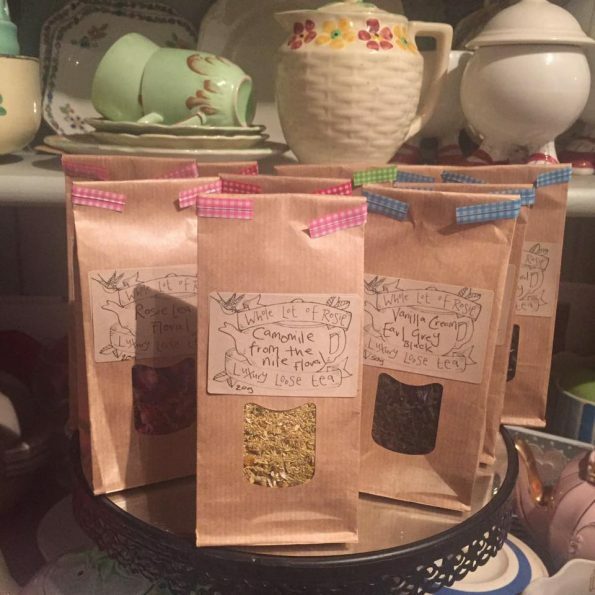 After setting up the brand initially as part of Ruby and Blue the teas have been sold at teashops, food festivals and markets across the North of England for some years now. The gorgeous little brown packets of tea have developed, more recently to be emblazoned with the Whole Lot of Rosie logo, and the blends have made it as far as Canada and the US. We hope you love the tea as much as we do and you have fun looking through our range. Tell us if you want to see something new, and we’ll see what we can do.